We’re going to call her Deeza, for short. She’s an Icelandic Sheepdog, like Bjarki, and I just picked her up today. She’s a little spitfire! Soft and fluffy and quite brave. Today has been all about picking her up at the airport and bringing her home, and working with her and Bjarki to co-exist. That’s going pretty well, actually, mostly because she is so brave. She’s just recently weaned, too, so keeps rooting all over, poor thing. So now we have a male and female purebred Icelandic Sheepdog. Woo! This entry was posted in Bjarki, Töfradís. Bookmark the permalink. Post a comment or leave a trackback: Trackback URL. Adorable! We have an icie too. Our Luka is almost 8 months! What a terrific breed. Has Bjarki started herding yet? Did Tofradis come directly from Iceland, or arrive from somewhere closer? We got her from Sólhundur Icelandics in Toronto. 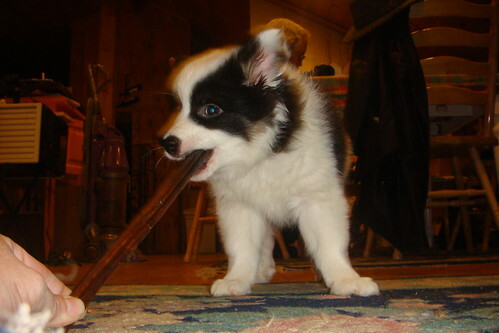 She’s the one who tested the best for herding, and she’s so cute! Bjarki’s herding quite well these days. I’d love to go to some actual herding classes, but I guess those will wait for summer. Just about the cutest puppy ever…. I’ve been seeing her photos on your flickr account and wondering about the breed and then thought to check your weblog. Duh!